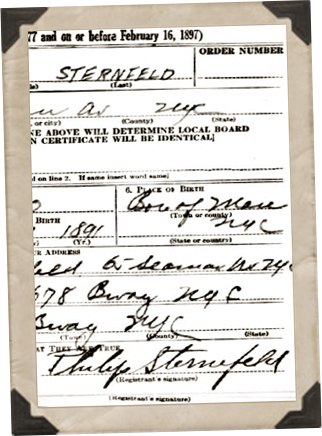 Philip Sternefeld was born 24 July 1891 in Manhattan, New York, New York, USA at 217 E. 122nd Street, East Harlem. 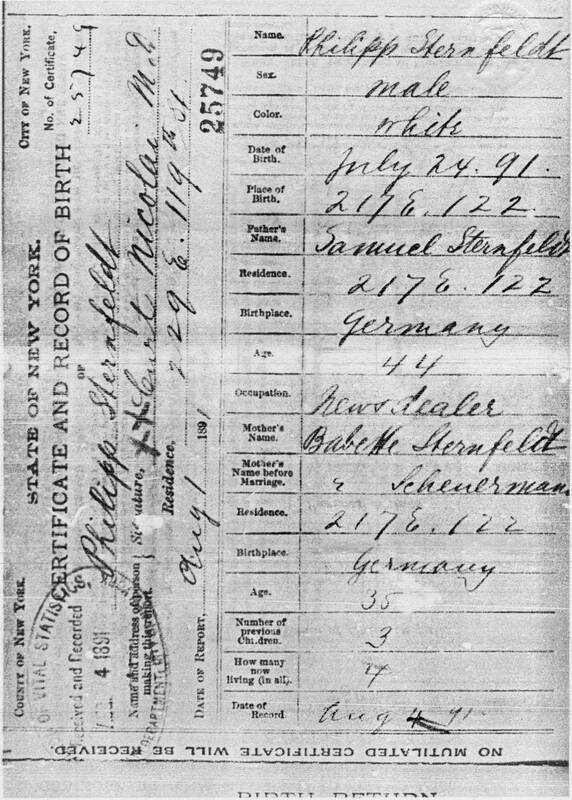 His parents Samuel Sternefeld and Babetta "Barbara" Scheierman, were Jewish immigrants. Samuel had arrived in New York 10 years earlier from the Netherlands (sometime referred to as Holland) and Babetta 7 years before Sam from Germany. Philip was the youngest of five children. Brother Emil, born 1886, Sisters Bertha, born 1879, Sadie, born 1883, and Jennie, 1887. Bertha was Philip's half-sister. She was born to father Samuel's first wife, Bella, who died a short time after they arrived in America. Philip's father Samuel died on 21 Dec 1895 at the age of 48. Philip was only 4 years old. 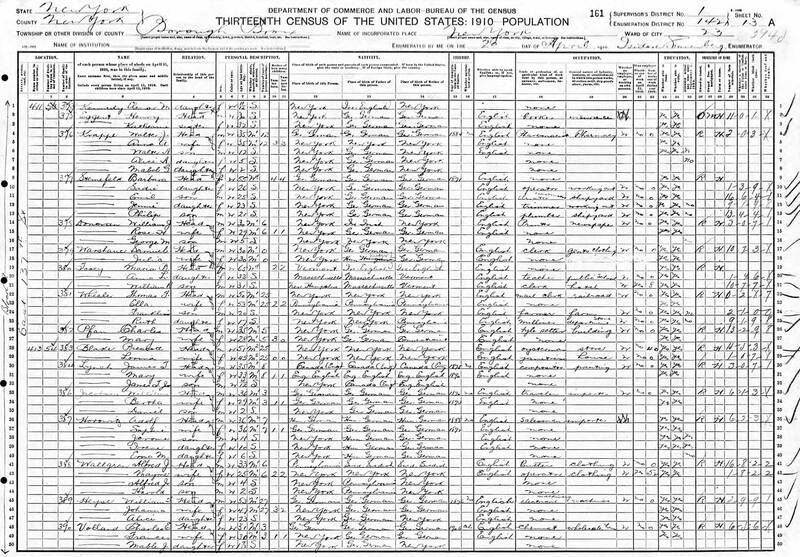 On the 1900 Federal census the family was living in an apartment at 245 East 112th Street between Gramercy Park and East Village & Alphabet City in Lower Manhattan. The 3 eldest children appear to be holding jobs to support the family as mother Barbara is raising the children. The girls Bertha and Sadie are both working as operators and brother Emil is an "office boy". 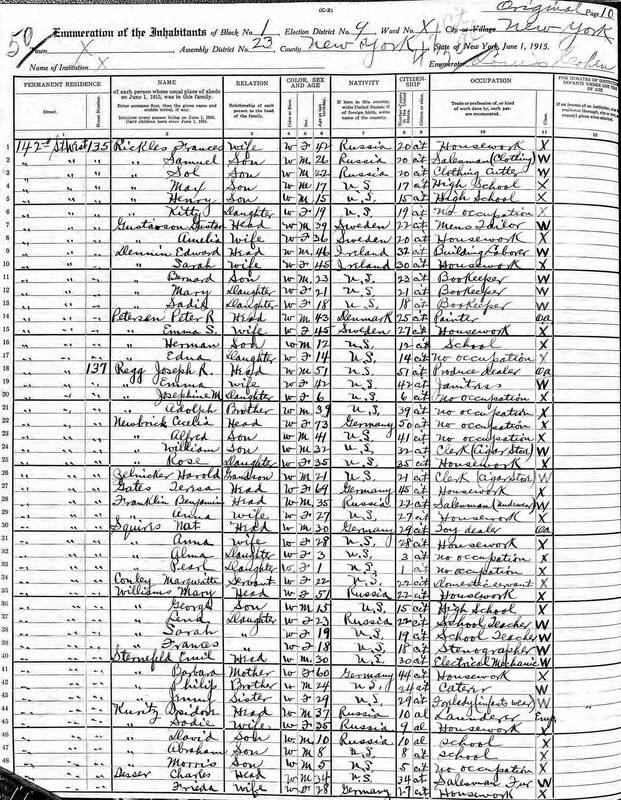 On the 1905 New York census the family was still at E 112th. Bertha had married and left by this time, Emil was now an Elevator worker and Jennie had joined Sadie as an operator for what appears to be written as Infants wear. 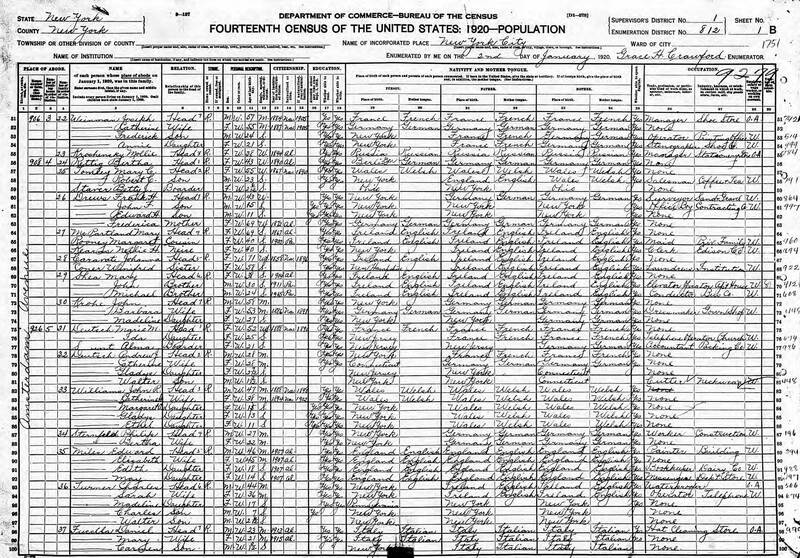 By the 1910 federal census, the family had moved to 411 East 137th Street in Mott Haven in the south-west Bronx near Randalls Island. 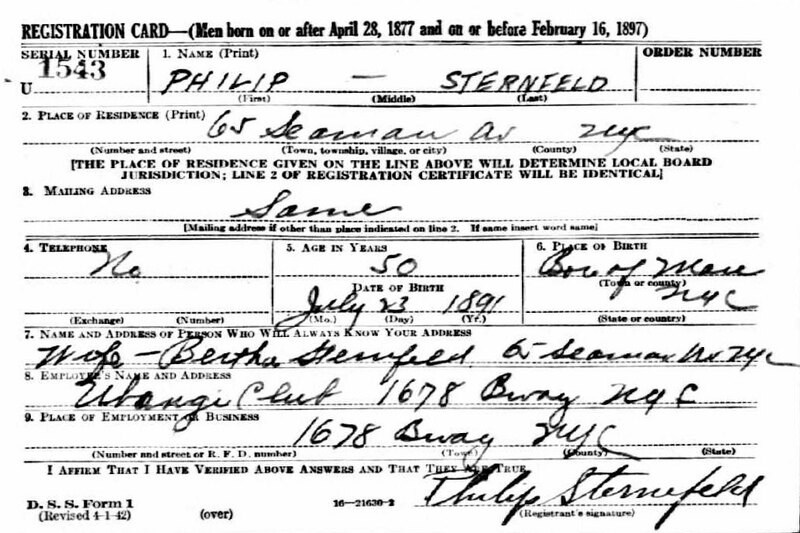 Philip was now 19 (written by census taker as 21) and working as a plumber in a shipyard. The same shipyard I'd assume that his brother Emil was working in as an Elevator constructor. Sadie, 26, and Jennie, 23, were both still living with the family. Sadie was still an operator, but Jennie, who looks to still be in the same field is no longer listed as an operator, but is now a "trimmer". 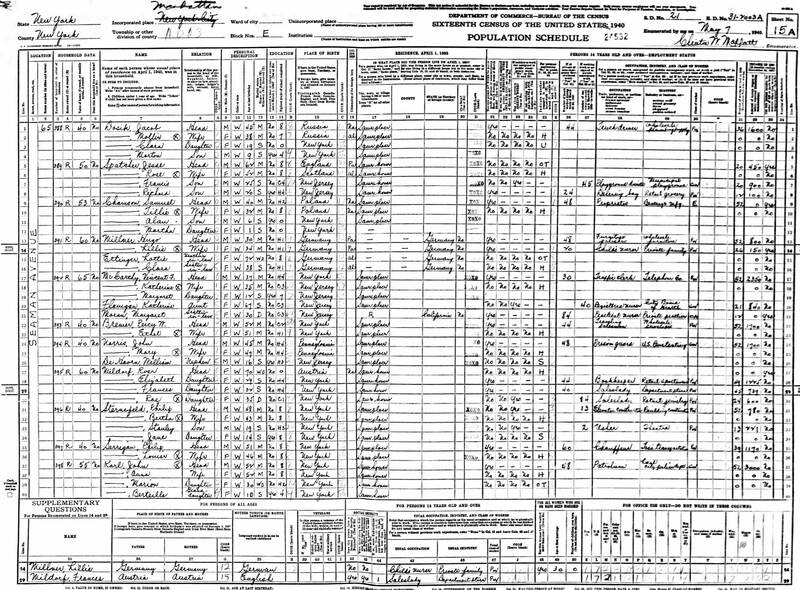 01 June 1915 the 1915 New York State census is enumerated. Here the family has again relocated. This time they are living at 137 West 142nd Street between Upper Manhattan and Strivers' Row, just north of Harlem. Philip, now 23, was working as a Caterer. By this point, Sadie had married and left the family, and Emil, an electircal mechanic, is now listed as taking over for his mother as the head of the house. Jennie, 29, is listed as a "Forelady" working in infants wear. By 1917 the family would move again. This time to 680 St. Nicholas Ave. between Upper Manhattan and Sugar Hill. 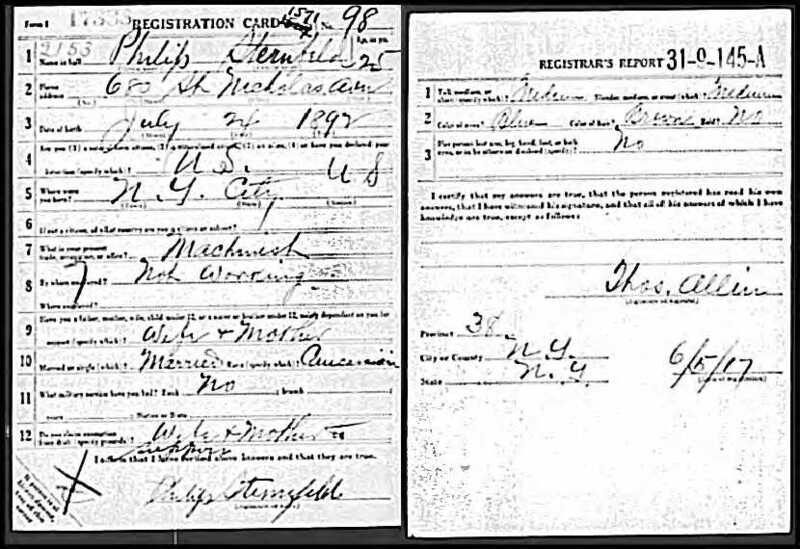 It's here Philip lived when he registered for the first World War. 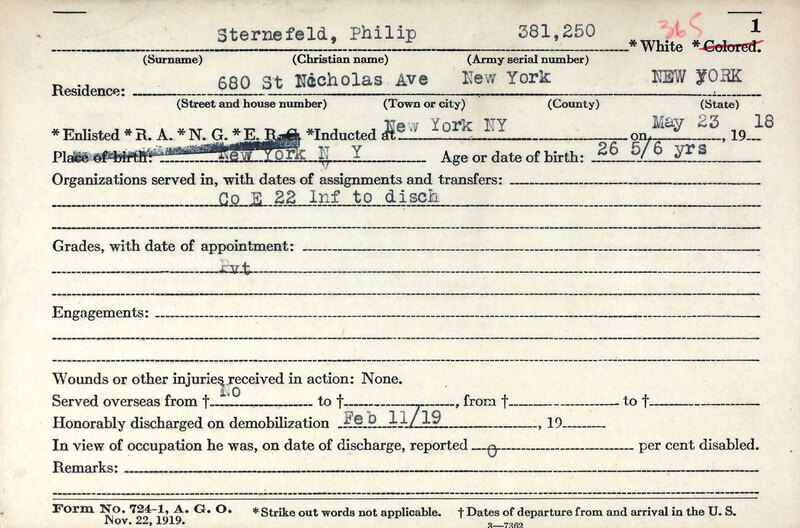 On 23 May 1918, Philip joined the U.S. Army as a private in Company E of the 22nd Infantry. It appears that after basic training Philip's regiment was charged with guarding the docks and port of New York (Hoboken, NJ) Some of the regiment even guarded major buildings, including the Capitol and White House in Washington, DC. This was no small task as the port of New York was the port of all major American Military departures for the war in Europe and it's security was of the utmost importance. The 22nd infantry takes great pride in the fact that there were no successful attempts to jeopardize the port's security under their watch. On 11 February 1919 Philip was honorably discharged on demobilization of his military unit. Previously, on 11 November 1918, the armistice was signed with Germany, and all military operations against the enemy were suspended at 11 A. M. that day. 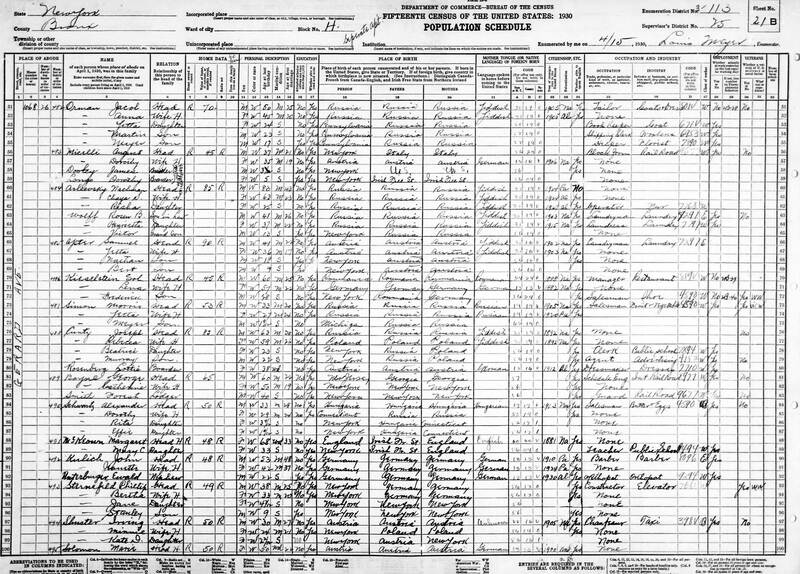 By 02 January 1920, when the 1920 US Federal census was enumerated, Philip and Bertha had moved out on their own and were living at 926 Amsterdam Ave. in Manhattan. This was north of Upper West Side & south of Morningside Heights between Riverside and Central Park. Philip was now employed as a construction worker. On 15 Dec 1920, Philip and Bertha welcome son Stanley Henry Sternefeld into the world. 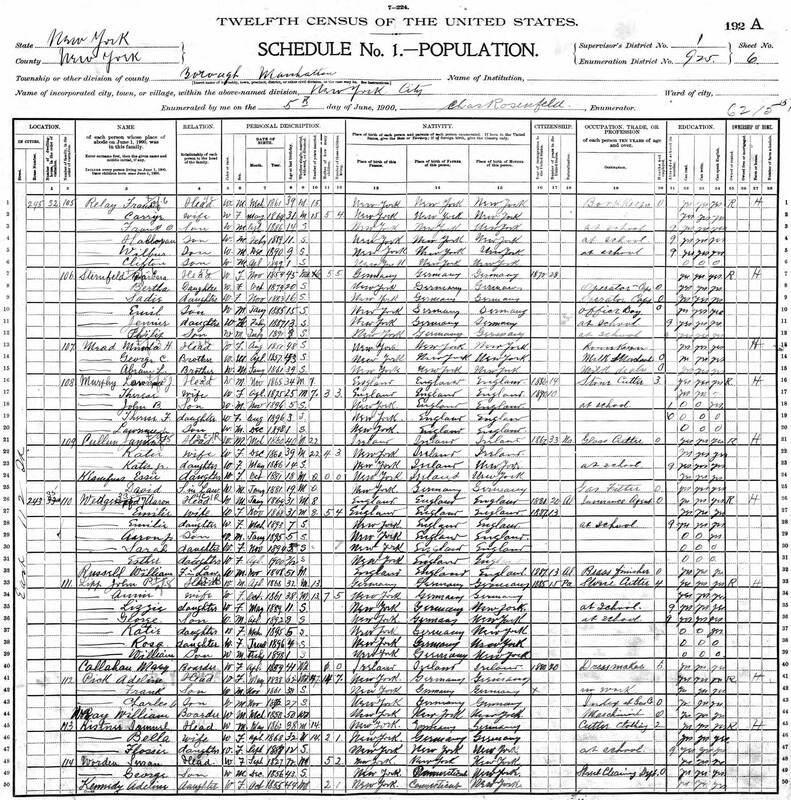 By the 1930 census the family had moved into the Bronx. They were now living at 1068 Gerard Ave. in Concourse. Philip was now living 3 blocks northeast of the original Yankee stadium (Babe Ruth playd for the Yankees 1920-1934). 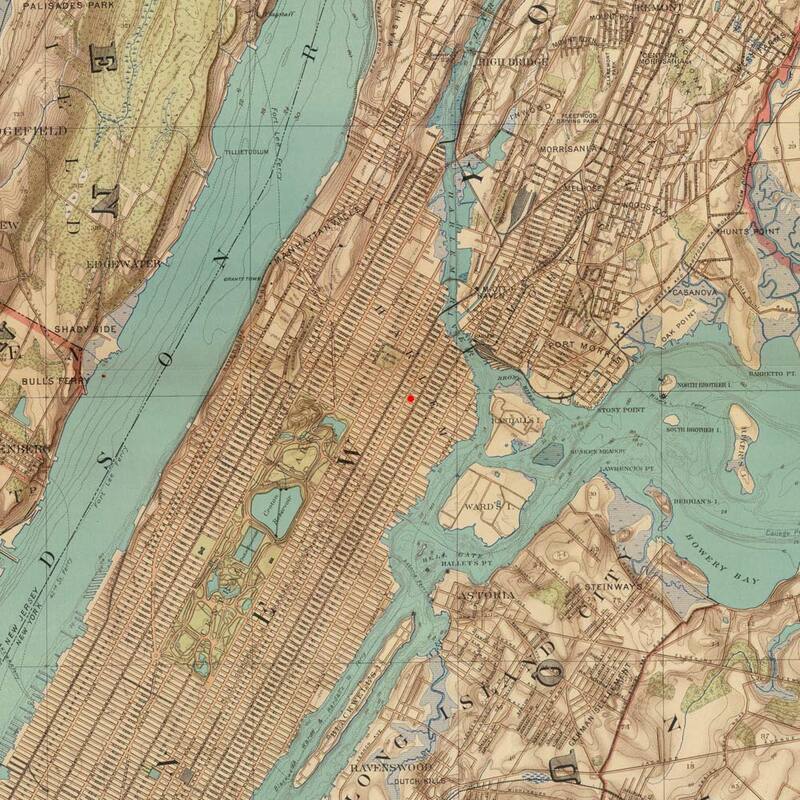 When the 1940 census was enumerated, the family had moved to 65 Seaman Ave. on the north end of Manhattan in Inwood, one block south of Inwood Hill Park. Here Philip, now 48, is still listed as working in Elevator construction for general building construction work. His son Stanley, now 19, is working as a theatre usher. 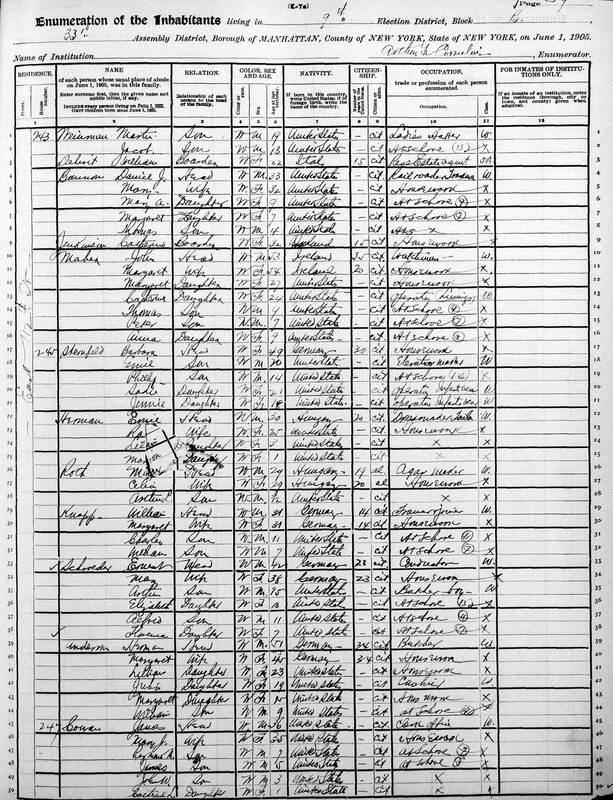 Philip and family were living on Seaman Ave in 1943 when Philip registered for the draft for World War II. Philip died 05 September 1957 at 66 years old. He was buried in Farmingdale, Suffolk, New York with military honors at the Long Island National Cemetery in Section 2a, Site 1934. A Family story says that Philip and Bertha married in secret and, in the beginning, Bertha would return home every night and put her wedding ring in her purse. Things stayed this way until one day Bertha's mother, Kuni, went to place something in Bertha's purse for her and discovered the ring, ending the secrecy. Apparently, the whole secrecy came about because of their difference in religion: Philip was "a nice Jewish boy" and Bertha's family was Catholic. After a few heart attacks and the ensuing TV sitcom where everyone learned a valuable lesson, the couple moved in together... How thing's actually played out in the family after the discovery I'm not certain, but the marriage saw Philip & Bertha's children brought up in the Catholic faith, which I'm sure appeased the Steinheimer family. U.S. Army Private, 22 Inf.